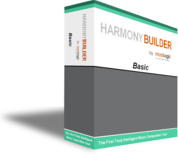 HarmonyBuilder (Basic) is a music score writer. Unlike any other notation software, it focuses primarily on playback flexibility, allowing you to move easily between notes and chords, and hear every detail in the process. This makes it ideal as a music composition tool that will effectively substitute for the piano keyboard. Key-related 4-part chords can be entered with one button click, and notes can be adjusted by simply nudging them. You'll be amazed how it will inspire you to create intricate 4-part harmony, and to fashion your harmonies into exciting rhythms, using the note split and meld buttons. Furthermore, you can email your score to friends who can open and play it from a browser, even if they don't have the editor. Musicians who want to share music scores among themselves.